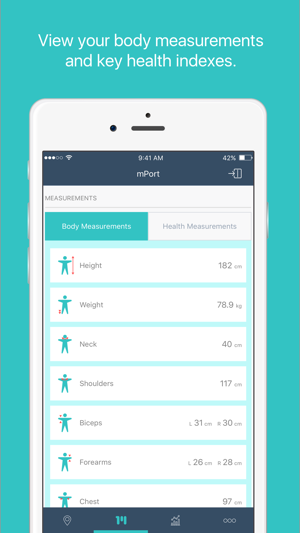 Download this free app to view and track your body shape, measurements and health indicators after each mapping session with mPort. mPort is a safe, affordable and accessible 3D body mapping service. 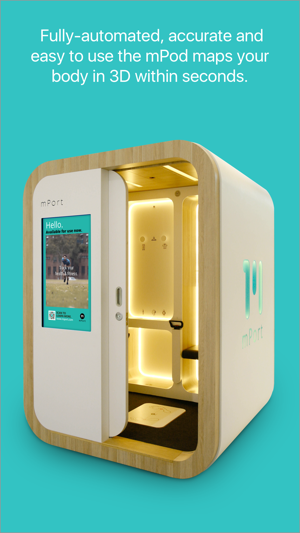 At the core of the mPort service is the mPod, an automated solution that provides highly accurate body measurements and health indicators while also providing key sizing data to help when shopping for clothes. 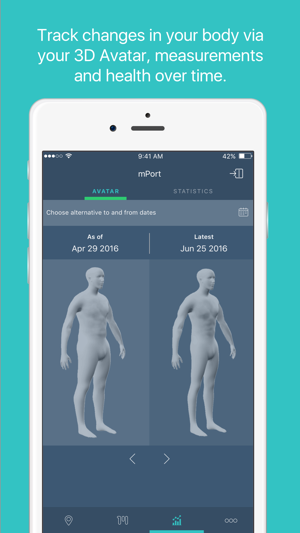 • View your body mapping results, including your 3D avatar. • View your key body measurements such as height, weight, biceps, shoulders, chest, waist and hips. • View your health indexes such as BMI, Body Fat, BMR, Waist-Height Ratio, Waist-Hip Ratio, Ideal Weight Range and Target Heart Rate. • Track changes in your body shape, measurements and health between mapping sessions. • Activate free 30-day Premium membership trial. • Find your nearest mPod. 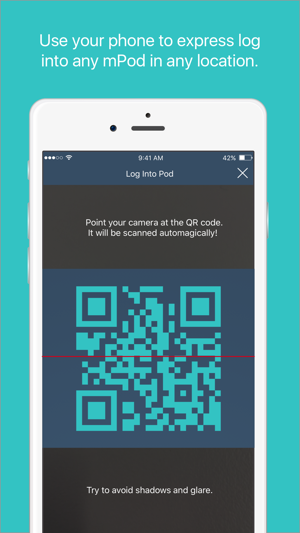 • Express login to mPod using the QR code reader. Thanks for using mPort! We're continually working to bring you the best app experience. This update contains stability improvements and bug-fixes. As a Personal Trainer, I see a lot of clients every day who are trying their best to achieve their goals while also managing their work schedule, what they eat and then trying to fit in a workout somewhere in the day. Stress levels are high and self esteem can be low. To add to that, they then step on the scales and can be incredibly disheartened from the number they see before them that in their minds just screams “I’m fat”, “I’m not worthy”, “Nothing I do is working, why bother?”. With mPort, my clients have been able to view a vast amount of measurements that explain EXACTLY what that overall number on the scale means and they can track their progress. They can see that sometimes gaining weight might instead be gaining muscle, which weighs more than fat. It also reveals important areas you should aim to target. All of a sudden self esteem levels are increasing with a better understanding of what’s happening on their fitness journey and less people are giving up so soon. My clients are learning more about their bodies, can track their progress via the app easily and are feeling better about themselves by having mPort keep them accountable. Thanks mPort! I’ve been using it for a few months now & am impressed (paid for the upgrade as it’s very cheap compared to others like DEXA or In-body). Like anything, it’s never 100% accurate if the conditions you scan under are different but it enables you to get a good idea of your current progress. I find scanning at the same time each day is the most accurate (ie. I scan first thing in the morning & always wear the same clothes). Any type of body comp analysis will be inaccurate if you wear different clothes, shoes etc so people need to remember to scan under the same conditions and I find it’s pretty accurate that way. Also the way you wear your hair affects your height so always tie your hair in a low bun so the scans are consistent. Overall I’m impressed (particularly by the price point) and it allows me to track my progress each month. User friendly quick and easy! 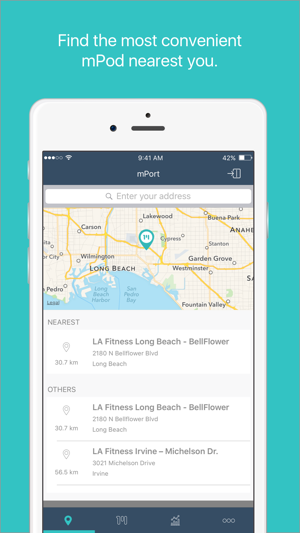 I’m new to mPort but so far have loved the experience especially for tracking my baby bump! I love that mPort provides 3D bodymapping of so many varied measurements e.g. BMR, BF%, chest, biceps, height, fat free mass %, baby bump progress and more! Providing 360 degree views side to side of my body and baby bump - and super accessible for easy view via the free app which I’ve found incredibly useful! It’s so awesome to see the wonderful changes my body is going through as the weeks and months of my second pregnancy continue to go by! Love mPort!! !